My friend ate her placenta. fried with garlic, oregano, thyme. The preoccupation with food throughout draws death into a different light; far from heaven and hell and the realms of god and spirit and the sentimental, Krissy draws death as an earthbound reality, gritty in our teeth, and as real and tangible and true as life. Although Eating My Grandmother is a litany of death, for me it evoked memories of pregnancy and birth, growing my children in my own body, birthing them in blood and fluid and holding their tiny bodies against my chest. The morbidity threaded throughout Eating My Grandmother is balanced, indeed interlinked with, tenderness and heart ache. that was never full in the first place. Her young flesh as bitter as the old. Her bones too steely to gnaw. I’ve only read this collection once so far, but it is already sitting on my desk, along with the books I know that I will reach for time and again. I don’t have a neat segue from poetry to cake. Mostly just a reminder, wrought by the reading of Eating My Grandmother, that despite the pursuits of the intellect, we are of our body. Our pleasures and our pains are felt in the fold of our ribs, with the tips of our fingers, the meat of our tongues. Our memories are stored deep in our ligaments, the aching of our back, the pit of our bellies. There is a reason, after all, that food features so strong in our memories. Food, at its most basic, is what we put into our bodies, to fatten and fill and nourish ourselves. And, if we do it right, we can knead a little of our love in there for those dear to us. 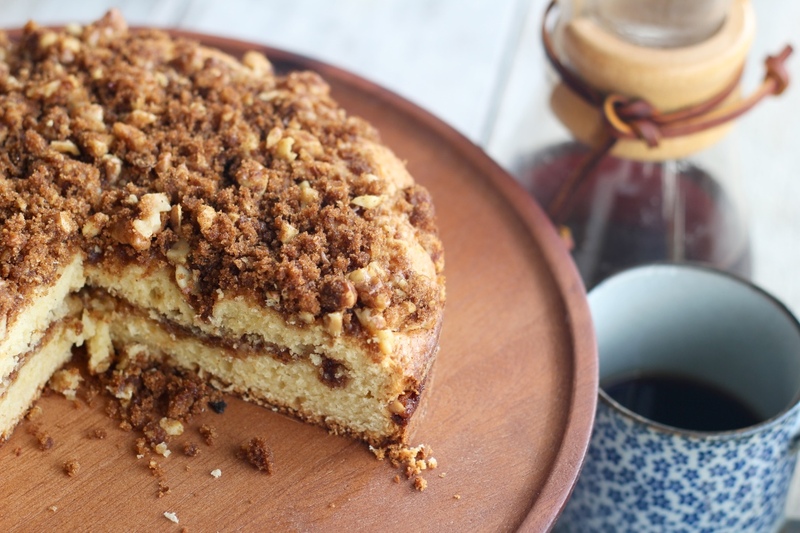 I’ve been baking this coffee cake for about six years now, several times a year. Indeed, it was the first thing I baked after my daughter was born, when she was barely a week old. The recipe is from a lovely little dessert book created by frankie magazine, and full of old-school treats like caramel slice, honey snaps, and raspberry scones. 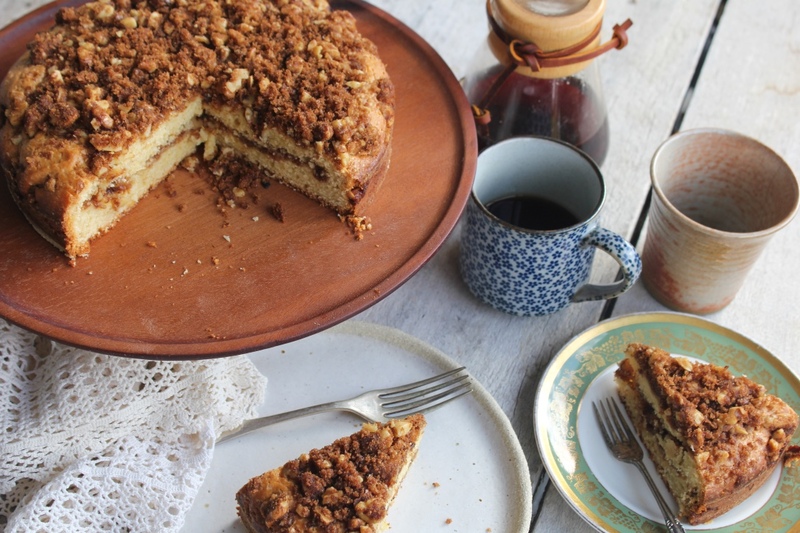 This particular cake is simple and nutty and buttery. 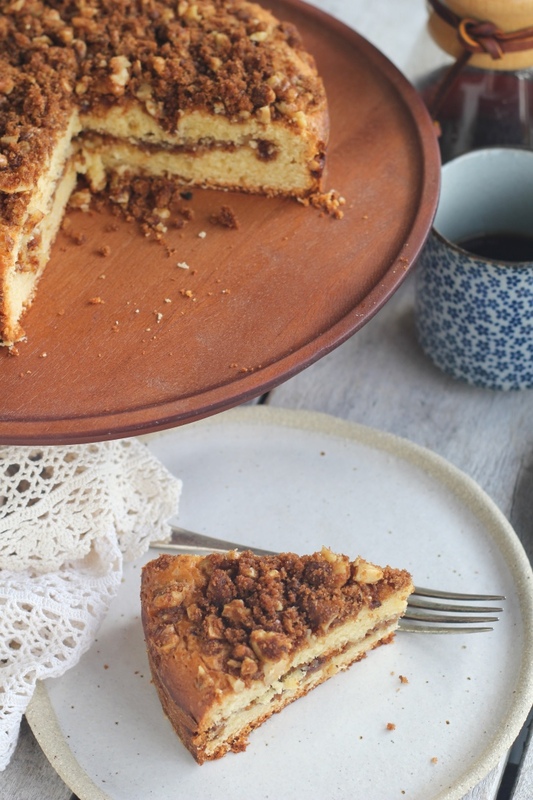 It is definitely S’s most requested cake, and is always delicious, always exactly what we want on the table for a rainy afternoon snack or a Sunday morning accompaniment to a black coffee. I will keep making this for my family in the years to come, so that the scent of melting butter swirled into brown sugar will always bring them home. Preheat oven to 180° celsius/350° fahrenheit. Grease and flour a round 20cm cake tin. Prepare the filling. In a bowl combine the brown sugar, flour, spices and salt. Roughly chop the walnuts and add to the bowl. Melt the butter then stir through the sugar mixture until well combined. Set aside. Into a medium sized bowl sift the flour, baking powder, and salt. In a large bowl combine the raw sugar and the eggs and whisk together until fully combined. Whisk the olive oil in, and then add the yoghurt and stir through. Add the dry ingredients to the wet, using a spatula or spoon to combine, taking care not to overmix. The batter should be quite thick. Pour half of the batter in the prepared tin, using the back of a spatula to spread evenly across. Sprinkle half of the filling across the batter in a single even layer. Add the remaining batter to the tin, spreading evenly (as it is quite thick, I like to dollop it on so as not to disturb the filling too much). Sprinkle the remaining filling over the top. Bake in the preheated oven for approx. 50 minutes, or until a skewer inserted comes away clean. Leave to cool in the pan for 15 minutes, then turn out. 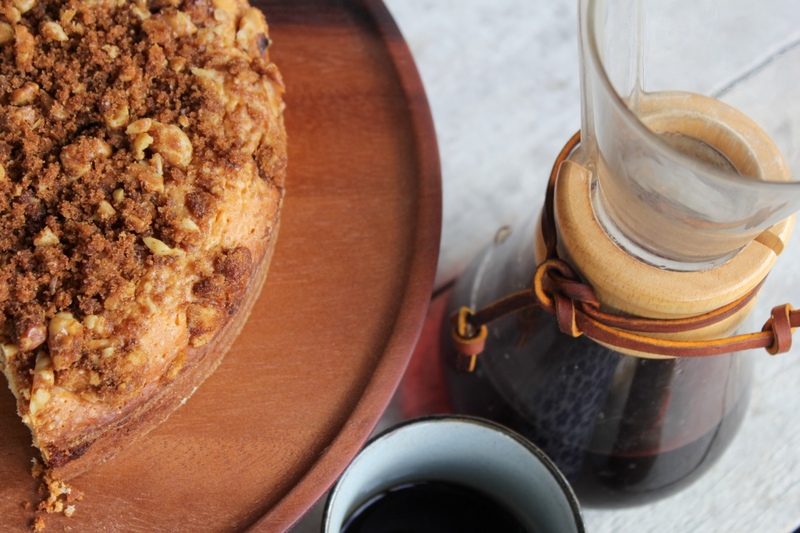 Serve warm or at room temperature, with a cup of black coffee or a dollop of whipped cream. 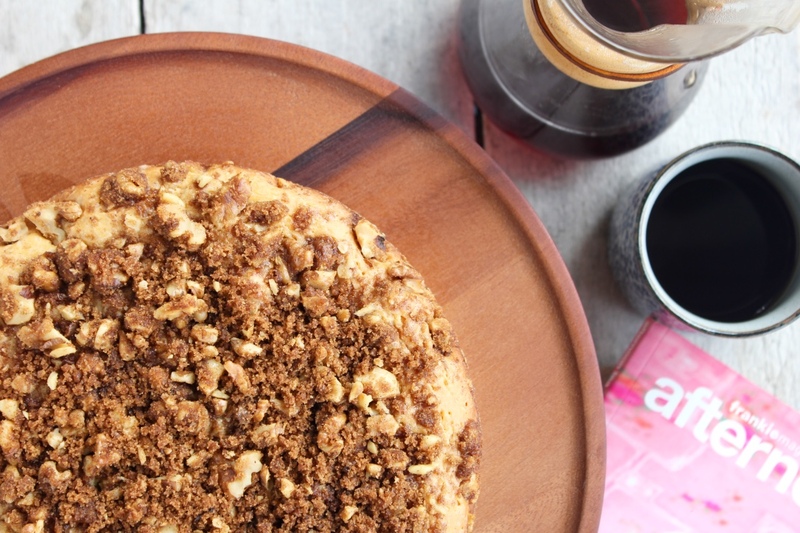 Now *this* is a coffee cake. 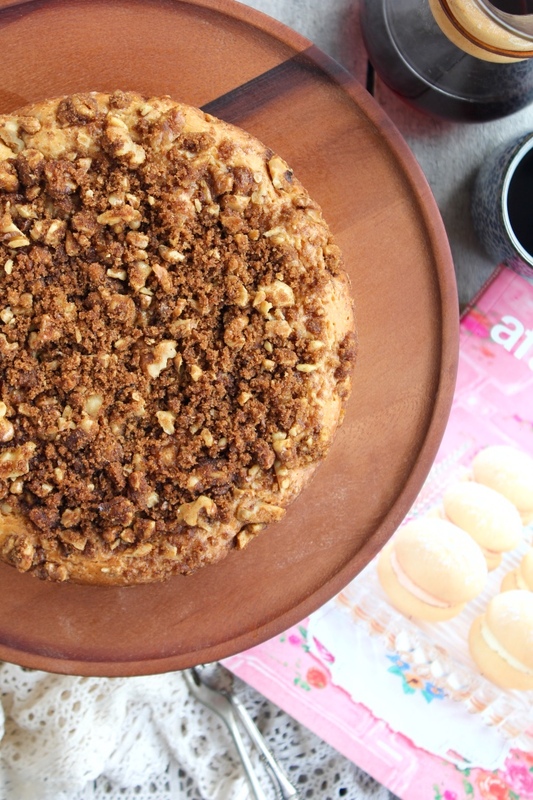 You always have the best baked goods and your writing and stories often reinspire me to get back in the kitchen on days when I’m feeling particularly tired of cooking. Thanks Katie. 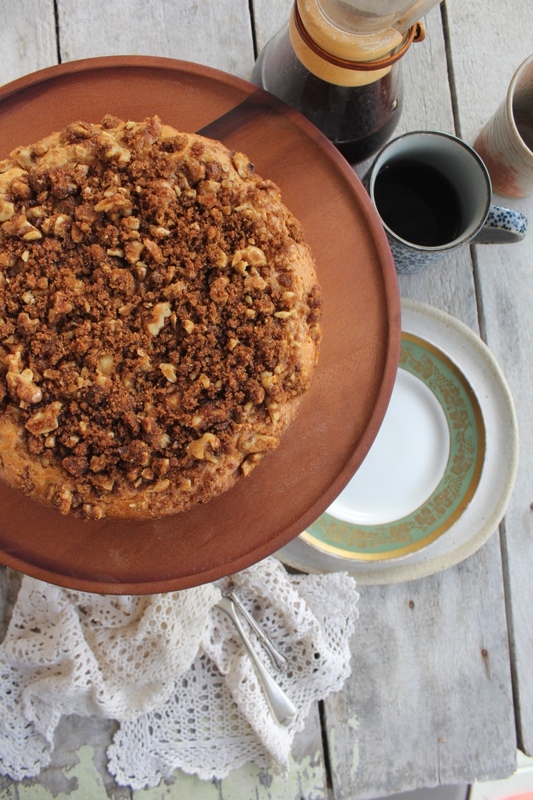 I started this blog to inspire myself to get back in the kitchen, so I love hearing that it is doing the same for you! List of ingredients includes 1/4 cup olive oil but I don’t see it mentioned in the instructions. Could you please clarify? Also, could I use 1/4 cup melted butter instead? I want to make this but want to be sure of the olive oil first. Thanks so much. Thanks for picking that up Hannele. I’ve updated the instructions (whisk the oil in after the eggs). You could easily replace the oil with melted butter – let me know how it goes!